From her portrayal of a California sorority girl in Legally Blonde, to her country singing roll as June Carter in Walk the Line, I've always been a fan of Reese Witherspoon. But it's not just her acting that makes me such a fan of hers, it's her fun, feminine, colorful sense of style that makes her one of my favorite celebrities. I love how she always looks so pretty where ever she is photographed. Whether she's wearing jeans and a sweater or a red carpet gown, she always looks great. 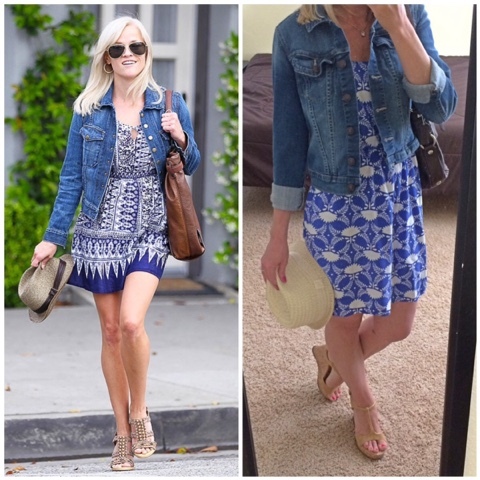 Here are a few of my favorite Reese Witherspoon inspired looks that I created using my own wardrobe. I love this look that Reese is wearing here. It's the perfect summer look! She's wearing a comfortable light weight blue print dress with a jean jacket, fun strappy sandals, a brown purse and a fedora in hand. I recreated this look with my new sundress from Old Navy (exact), wedge strappy sandals (similar), jean jacket (similar), brown leather coach purse and my fedora that I found in the dollar section of Target. When I was researching Reese Witherspoon's looks, I found tons of pictures of her in this casual summer look. Light khaki shorts with sandals and a button down shirt is a classic summer ensemble and Reese always looks great in this casual look. I was inspired by this look to put together this outfit with a pink button down (similar), khaki shorts from Old Navy (similar), and braided white sandals from Target (exact). This look is similar to the first look, with a casual dress, long boyfriend cardigan, wedge sandals and another fedora. 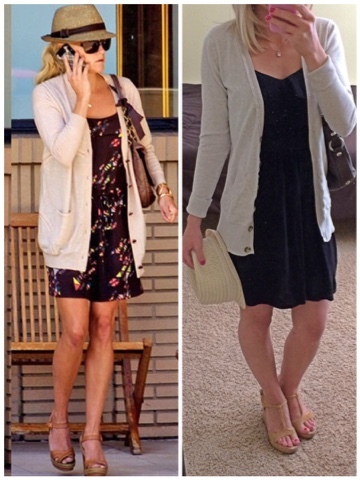 I recreated the look with a simple black sundress (similar), cream boyfriend cardigan (exact), wedge sandals (similar) and the same fedora from the first look. 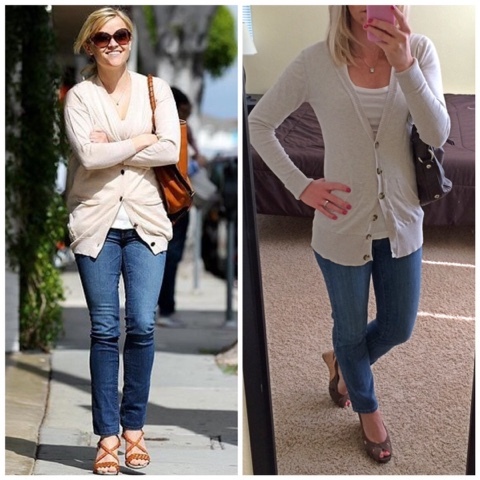 For the last Reese Witherspoon look, I recreated this casual jean look. I wore my LC Lauren Conrad jeans (similar), boyfriend cardigan from Target (exact), Steven Madden brown wedge shoes (similar), white t-shirt (exact) with my brown coach purse. Which one is your favorite Reese Witherspoon look?